This was built so that I can have a space to work on the design of my Master's Project. The top was a butcher block (Northern Soft Maple) from a home (where we built the replacement). 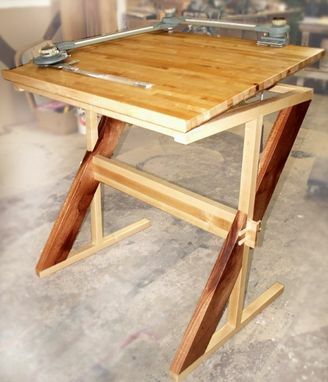 The "I" of the legs was shop scrap left over from building that replacement butcher block. The Fiddleback Maple of the pencil lip on the front of the table was from my personal stash. The back and front connector are pieces of maple that were rejected for their grain, on a job that wanted straight grain. 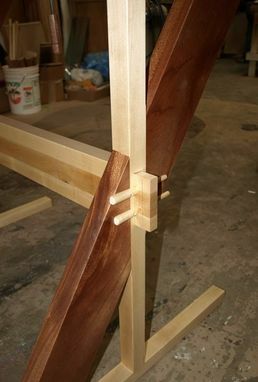 The African Mahogany "/" of the legs were a remnant after a large job of trophies. The four hand turned pins were random maple scraps from my firewood pile. 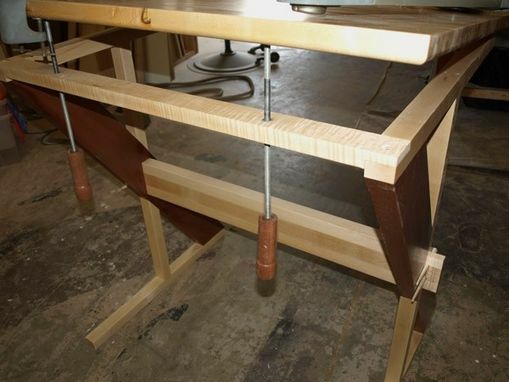 Two pieces of All-thread are set at the back with hand turned Mahogany handles. The drafting arm itself (Bruning) was given to me by my high school woodshop teacher when the high school disbanded the drafting class.